The latest version of Sony’s popular RX100 range of compact cameras, the Sony Cyber-shot DSC-RX100 IV, features a brand new sensor design. It retains the same pixel count as its predecessor, at 20.1 million, but a new stacked Exmor RS design sees a DRAM memory chip attached to the sensor itself for better readout speeds and increased speed when using the camera. A Bionz X processor - Sony’s most recent - is also included to work in conjunction with the sensor design for what is promised to be super quick speeds. For shooting in bright light with wide apertures, you can use Sony Cyber-shot DSC-RX100 IV’s new electronic (anti-distortion) shutter, which is capable of up to 1/32000. The lens offers an equivalent of 24-70mm, and has a maximum aperture of f/1.8-f/2.8. An electronic viewfinder was a new feature of the Mark III, and it remains here but with a notable increase in resolution - it’s now 2.35 million dots, while the old version had 1.44 million. For the first time in an RX100 model, 4K video recording is included, but it is limited to just five minutes of shooting. Another interesting new feature is 40x super slow motion video. 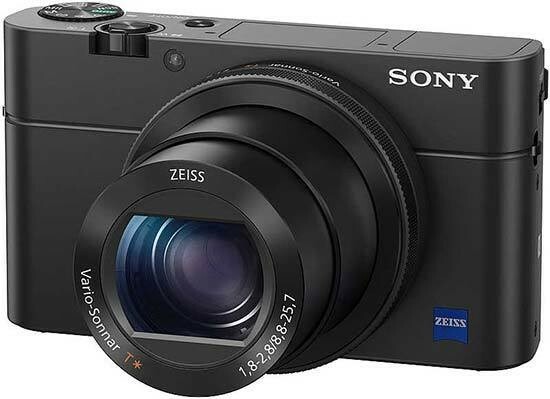 The Sony Cyber-shot DSC-RX100 IV retails for £919 / $949. To look at the Sony Cyber-shot DSC-RX100 IV and compare it with the Mark III, you’ll be hard pushed to find much of a difference. Sony has stuck with a sleek and small design here which should easily fit into most pockets, and certainly into your bag with ease. There’s not much in the way of grip on the front of the camera, but perhaps thanks to its reasonable weight, it still feels fairly safe in the hands - attaching a wrist strap can be of benefit though if you’re worried. The electronic viewfinder is hidden away inside the camera, which helps the Sony Cyber-shot DSC-RX100 IV keep its slick appearance when you don’t want to use it. On the side of the camera you’ll find a switch for popping up the viewfinder. Once you’ve done this, you’ll need to pull the back of it away from itself, otherwise the image inside the viewfinder will be blurry. Performing this action of popping up the viewfinder switches on the camera automatically, and placing it back inside its housing will switch off the camera. This is a function you can switch off if you prefer, but it makes for quite a quick start up process. Alternatively, there’s an on/off button on the top of the camera. 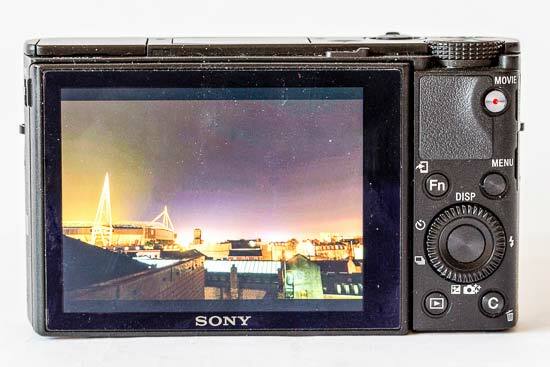 It would be nice if the whole process of using the viewfinder was fully automatic, but Sony’s engineers don’t seem to have found a way to do that just yet. 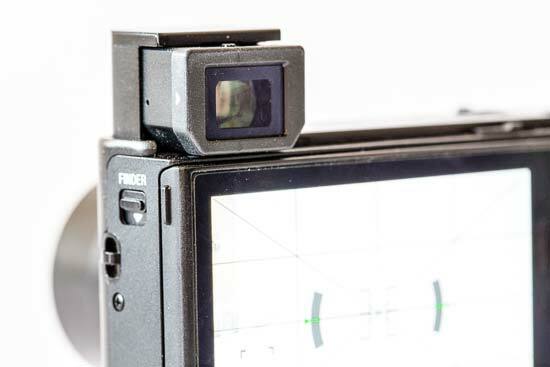 A sensor on the viewfinder itself makes for a seamless transition between using the screen on the finder - it will switch on as you bring it up to your eye. The viewfinder isn’t as large as something you’ll find on a DSLR or CSC, while there’s no eyecup to block out the distracting scene in front of you. That said, the increase in resolution makes it much more usable than its predecessor, and if you’re a fan of viewfinders you’ll be pleased to see it here. Around the Sony Cyber-shot DSC-RX100 IV's lens is a customisable control ring. By default it will control different parameters depending on the shooting mode you’re in. So, for instance, in aperture priority, twisting it will alter aperture. However, you can change it to something else if you prefer - such as ISO, Creative Style, White Balance or Exposure Compensation. A small custom button on the back of the camera can also be assigned to a number of different functions including all of those just mentioned and more. A mode dial can be found on top of the RX100 IV. Here you’ll find a variety of modes including manual, aperture priority, shutter priority and automatic modes. There’s also a handy space for a group of custom settings should you find yourself wanting to shoot a particular type of scene with frequency. A new addition here is HFR, or high frame rate, which is what you need to turn to when you want to capture super slow motion videos. 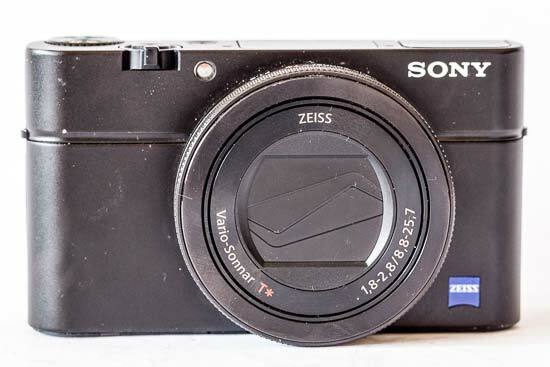 The Sony Cyber-shot DSC-RX100 IV’s screen is tiltable. It’s not fully articulated which isn’t quite so handy for awkwardly positioned portrait shots, but you can point it all the way forwards for taking selfies. Should you put it in this position, selfie mode will be activated, switching on face detection and a self-timer. 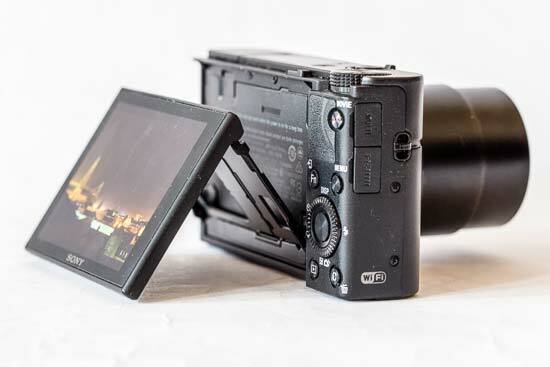 If you have the viewfinder raised, you’ll need to get rid of it to see all of the screen… which of course turns the camera off and you’ll need to switch it back on. Sadly, this screen is not touch sensitive as this would make setting the autofocus point much easier. If you have Flexible Spot AF mode selected, it’s not a complicated process to set the AF point - you simply press the central button of the navigation pad, and then use the scrolling dial or directional keys to choose the point you want. However, if you’re travelling from one side of the scene to the other, it can feel like a long time to be faffing about with AF points when a simple tap of a screen would get the job done almost instantly. Speaking of these navigational keys, these keys can be customised to different functions as well. The down key accesses exposure compensation by default though, while the right key is for flash modes, and the left for self-timer and drive modes. The up key changes the way the display looks. Pressing the display key switches on the RX100 IV’s inbuilt level, which is useful when shooting landscapes and you want to get the horizon straight. You can also see the level in the viewfinder if you wish. Wi-Fi and NFC is very quick and easy to use with the Sony Cyber-shot DSC-RX100 IV and once you’ve set it up once for Wi-Fi with the password, that process becomes even quicker. You can send across individual or sets of photos for sharing across social networks. To control the camera remotely, you use one of the PlayMemories apps under the main menu, and you’ve got a good range of different controls here (including aperture, ISO, exposure compensation and so on), which is nice to see and makes it actually genuinely useful. The menu button accesses the camera’s main menu, and here there’s a little bit of an overwhelming amount of options to navigate through - so it can be worth sitting down with the camera and the instruction manual to really get to grips with everything the RX100 IV has to offer. A quick menu can be accessed by pressing the function (Fn) button. This menu is customisable which is good for only including the settings you tend to change most often. In order to use some of the Sony Cyber-shot DSC-RX100 IV’s functions, such as Picture Effects, you’ll need to switch to JPEG only shooting. It’s a bit of a faff having to switch this on and off, so it would be nice if Sony could make it possible to shoot more in raw format - or come up with an automated on/off process for file quality if that’s not possible. The introduction of the new sensor design does indeed seem to translate into a very quick shooting experience. Moving through the menus and so on is speedy, while autofocus speeds are very snappy. If the light drops, the lens will hunt a little more to acquire focus, but a false positive being presented is very rare. There’s no supplied separate battery charger with the Sony Cyber-shot DSC-RX100 IV meaning you have to charge it in body. On the one hand, this can be handy when you don’t have access to a spare plug socket as you can charge it directly from a computer, but it also means that you can’t be charging one battery while using another. As something which appeals to travelling photographers, this seems a bit of an oversight, and it may be worth investing in a second battery and charger if you’re planning to use it extensively on your travels as the quoted battery life may not last a full day.